Readers of my Dressmakers series will come upon strange words dealing with apparel. The endnotes of Vixen in Velvet include a list of fabrics mentioned in the story. But other fashion terms might leave readers scratching their heads. I, too, scratch my head, and study books and search online, sometimes to no avail. Then I summon help from the Milliners, Mantuamakers, and Tailors of Colonial Williamsburg. 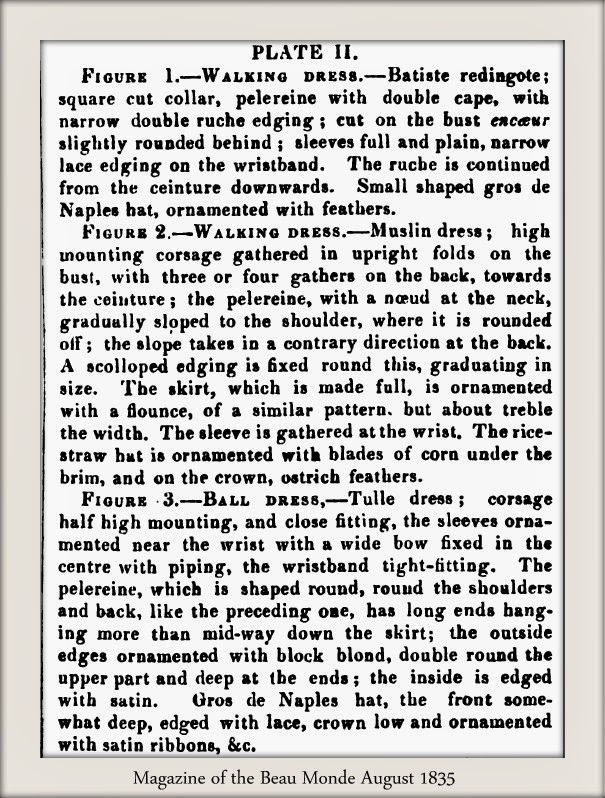 Since the pelerine appears frequently in 19th century ladies’ attire, it seems like a good item for discussion and illustration. 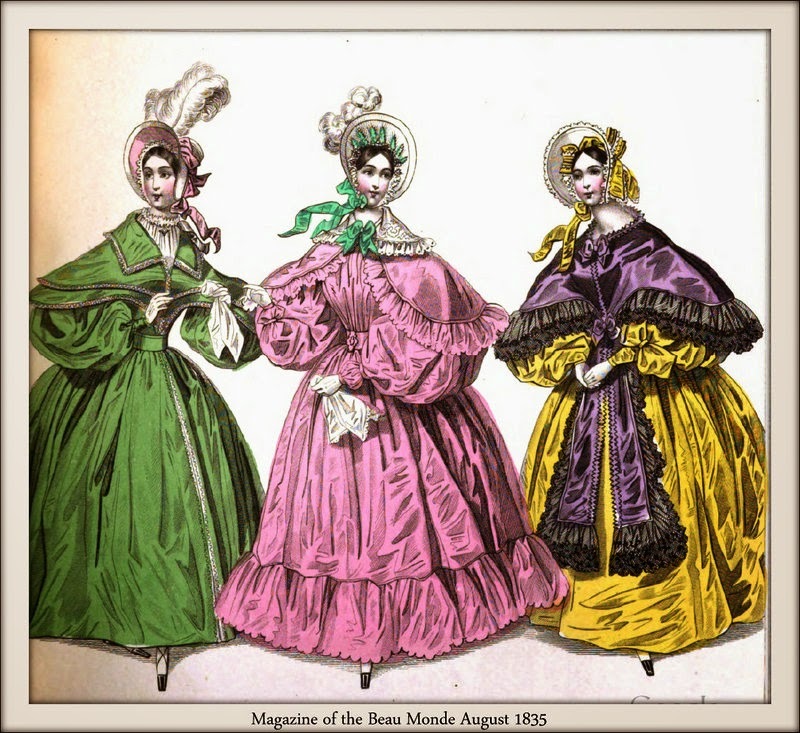 Above left are three examples from the 1835 Magazine of the Beau Monde, which apparently stole from other magazines. I suspect it’s not the reverse, because dresses shown in, for instance, the July La Mode, appear a month later in MBM. Those of you who click on the caption to view the dresses at Google Books will notice that the image is black & white. I have no idea why this is. I downloaded the PDF from this edition, and I have more color images than appear online. You may also notice that the woman on the right, who is wearing a ball dress, according to the description, is wearing a style of hat one would not normally associate with evening wear. The magazine shows a couple of these, so it doesn’t seem to be a mistake—but I find it odd to imagine a lady dancing, wearing this. Next week, please look for a post on the topic, What to Put on Your Head for a Party. As always, please click on the images to enlarge. Clicking on captions will take you to the magazine page at Google Books. I'm fairly certain saw would have taken off both hat & pelerine once at the ball, so not dancing in them. There may or may not have been other hardware under the hat for evening wear. I have to agree with some of your heroes who lament these styles. They'd be great for those of us with (ahem) imperfect figures, but they're so cumbersome! Well, it's narrow compared to a full cape, LOL! This illustration readily shows why I really never cared for the styles from the 1830's. Those sloped shoulders are the ugliest mode I have ever seen (of course, I have the square shoulders of both my Father and Mother); but, then the largest, puffiest sleeves ever are placed on the garment! (I usually like a larger sleeve myself; but these are too much.) My periods are still the 18th century and the intervening neo-classical. The pelerine was used as a light cover, almost like a shawl, the lady going to the ball would have been wearing it to protect the dress and the lady for dirt and the chill, she then would have removed the pelerine upon arrival at the ball. During the 19th century a lady would have to have proper head covering when she went out of doors, even in the evening. I would wage a guess, since the 1860s is my time period, that the hat on the lady in the ball gown was a period fad for fashionable evening wear. Lady periods would have fancy hoods for ladies attending balls, and fancy bonnets and hoods made specifically for different evening outings such as attending the theatre or the opera. Michelle, I'm liking your theory about period fad. Given how complicated hairdos were, I found it hard to imagine a lady taking off the hat when she got to the ball. At this time, the hair is springing up into loops--the Apollo Knot is still popular--so the logistics of keeping the hair nice after taking off the hat really puzzled me. We all have our preferences when it comes to styles, especially historical fashions, and the 1830s styles don't strike me as flattering. But it's so much fun to write about--a source of humor and sexiness (yes, it's a floaty style, with fascinating fluttering).